Outer Banks Box Blog – Page 2 – The Outer Banks, Delivered! Falling in love with the Outer Banks is easy to do in autumn. The warm sunny rays beam down on the sand and you can enjoy crisp temperatures and strolls on the wide open beaches. Fishing it at its finest and the local community is bustling with events and annual celebrations. 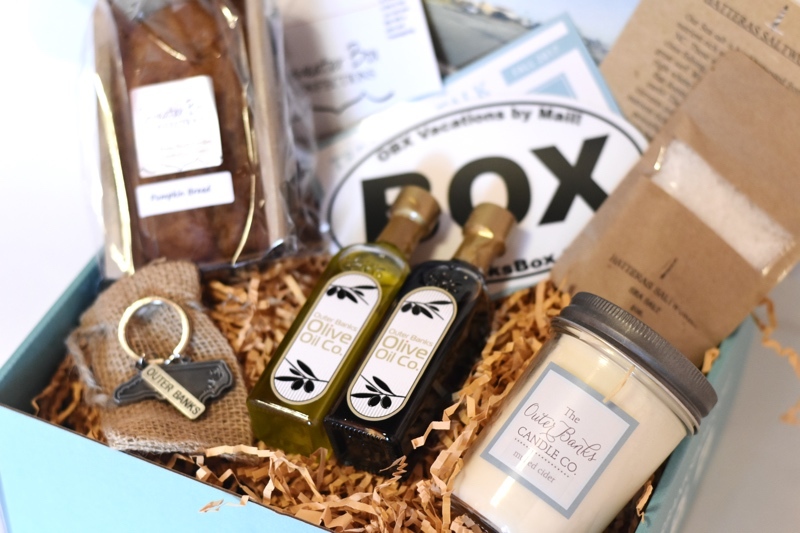 We made every effort to capture the essence of autumn on the OBX and deliver it up in our first ever fall box! See below what was included then make sure to sign up for shipments so you don’t miss out on the fun! 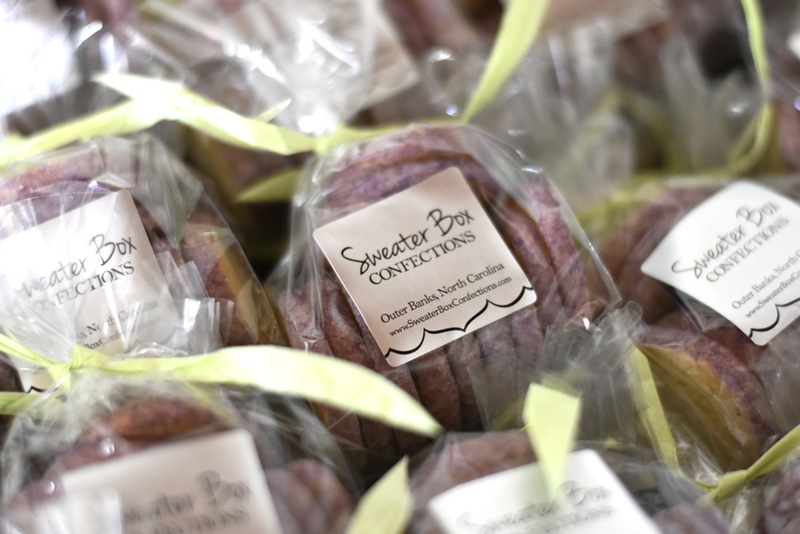 Back for another appearance in the Outer Banks Box is Sweater Box Confections! You may remember the tasty lavender cookies from our spring box, which were such a hit that we are always open to including more of their creations! After sampling a mini-sized loaf of Pumpkin Bread, it was game over; we knew it had to be included in our fall box as an essential edible for subscribers to enjoy! If you’re looking to make your holidays even more special, Chris bakes up delicious pies and even more bread and homemade butter that can be delivered to your door. Through the end of 2017, use code OBXBOX10 to save 10% off your online orders at SweaterBoxConfections.com! 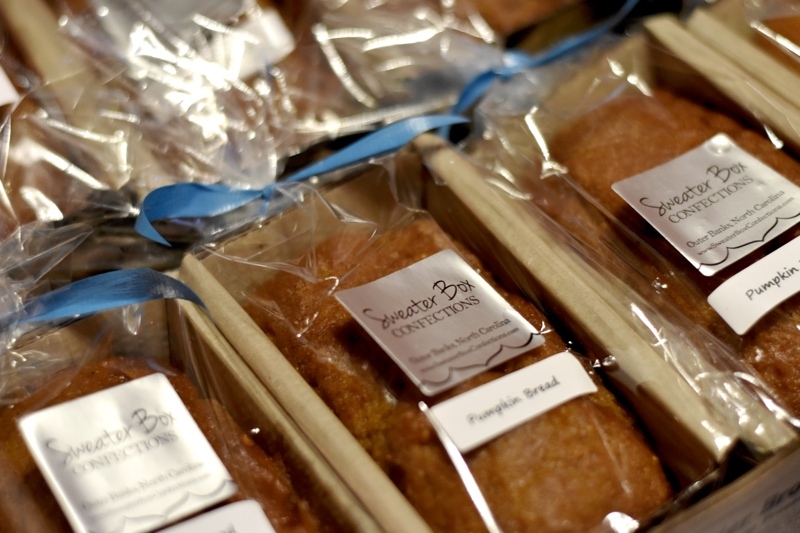 Try a larger loaf of Pumpkin Bread and Cranberry Butter or some tasty pies for delighting your guests this season. Vintage Soy Wax Candles – Outer Banks Candle Co. Sometimes there’s nothing cozier than cuddling up with a blanket, a book, and enjoying the ambiance of a richly scented candle. Given that, it was a no-brainer to seek out a locally made candle that would warm your home with smells of the season. Kimber Smith at the Outer Banks Candle Co. hand pours a wide variety of premium candles right in Kitty Hawk, NC. Her work has evolved over the years and has set the benchmark for quality. All of our subscribers received a full-size 8oz vintage style soy candle. Scents chosen were mulled cider and pumpkin cobbler. Tell me that doesn’t sound amazing! The Outer Banks Candle Co. offers a large assortment of candles, scents, and even pre-made gift baskets that are perfect for holiday giving. Take a peek over at TheOuterBanksCandleCompany.com and use code OBXBOX for $10 OFF your orders! It doesn’t get much more direct than this! You want the OBX? You get the OBX! The crew over at Hatteras Saltworks takes fresh Atlantic Ocean water and turns it into savory enjoyment for all. Subscribers received a bag of their hand-harvested, solar evaporated, unrefined, 100% pure sea salt that’s perfect for just about any meal! Besides original, they also offer tempting flavor infusions like rosemary sea salt and pecan smoked sea salt that’s done right on site! Sound tempting? Their running a special right now on a trio pack so you can try them all! Learn more about them and place your orders at HatterasSaltWorks.com! 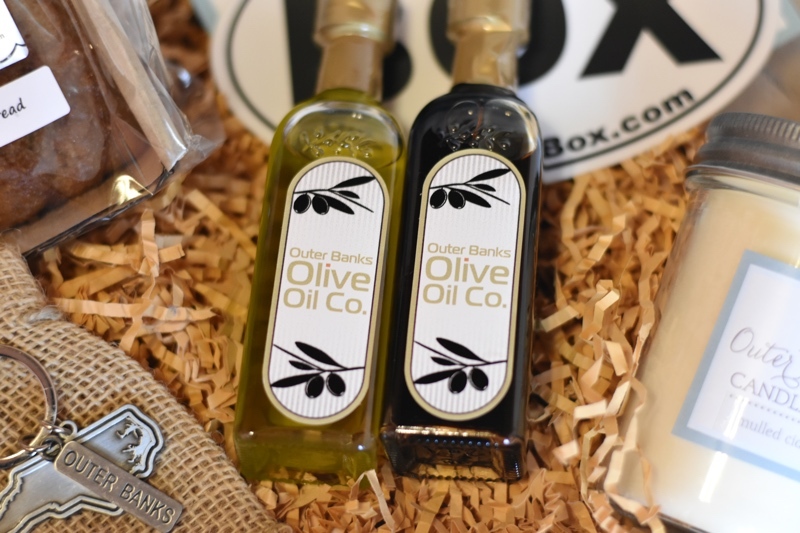 Olive Oil & Vinegar Set – Outer Banks Olive Oil Co.
Hearty ingredients and robust flavors are the cornerstone of culinary creations as the weather gets colder and the holidays approach us. Knowing that, it seemed no better time to highlight a local purveyor of fine olive oils and vinegars on the Outer Banks! 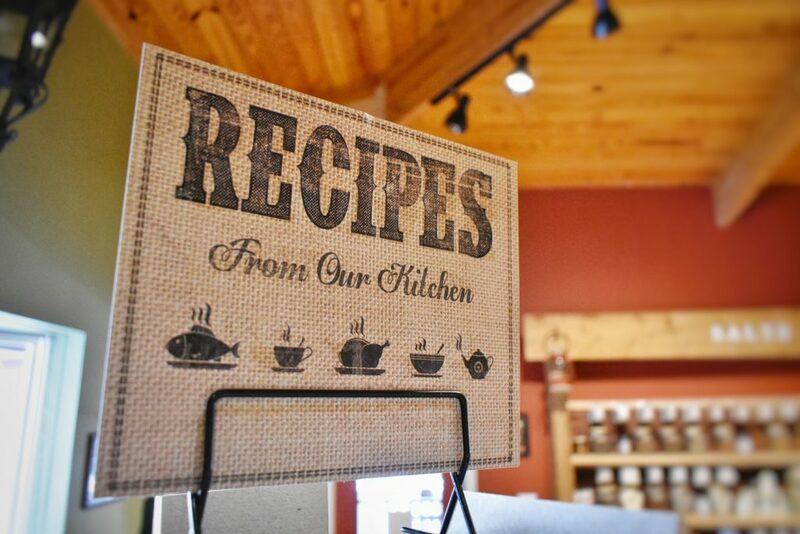 The Outer Banks Olive Oil Company provides a wide variety of the world’s freshest premium extra virgin olive oils, balsamic vinegars, specialty oils, and vinegars. 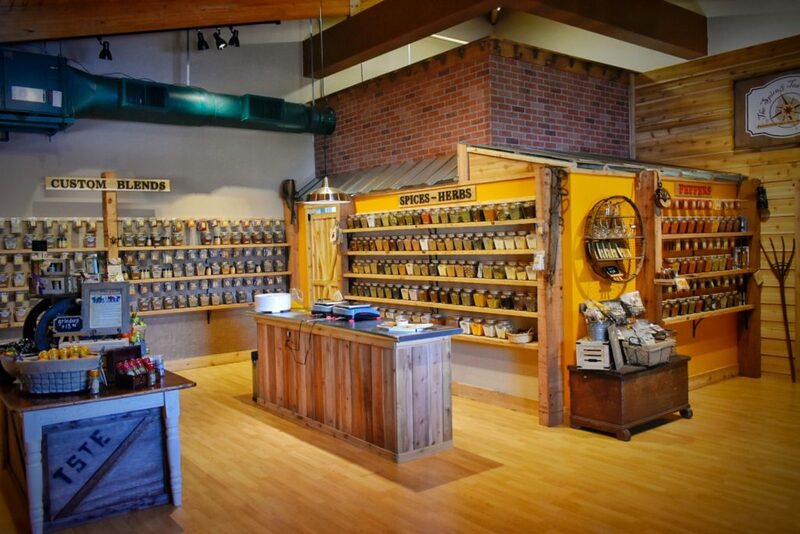 When you visit their locations, you get to experience the largest and freshest selection of artisan oils and vinegars in the region. Subscribers received bottles of both the Tuscan Herb Olive Oil and Traditional Aged Balsamic Vinegar. Serves 4-6. Prep Time 5 min. You’ll need 10 chopped cherry tomatoes, 1 chopped avocado, 8 finely diced basil leaves, 4 oz cubed Gouda cheese, 1/2 bunch diced scallions, and 2tbsp Tuscan Herb Olive Oil. Mix all ingredients and serve with tortilla chips. As a special offer, use code SAVE15 in the comments section online to get 15% OFF any oil or vinegar through the end of November! Go to OuterBanksOlive.com to order! So, are you ready to start getting your own doses of the Outer Banks while you’re not on vacation? We can help! We put this big blue button down below so you can get signed up for our quarterly shipments that go out each season. You can get just one as a gift, pay box-to-box, or even pre-pay for a whole year and save $10! Welcome to another Outer Banks Box reveal blog! Summer is in full swing on the OBX and hundreds of happy Outer Banks Box subscribers are enjoying the contents of our latest shipment. Read for yourself what was included then make sure to sign up for shipments so you don’t miss out on the fun! Extras, if available, are here. One of our most highly rated, the 2017 Summer Box had a balanced assortment of both consumables and usables! 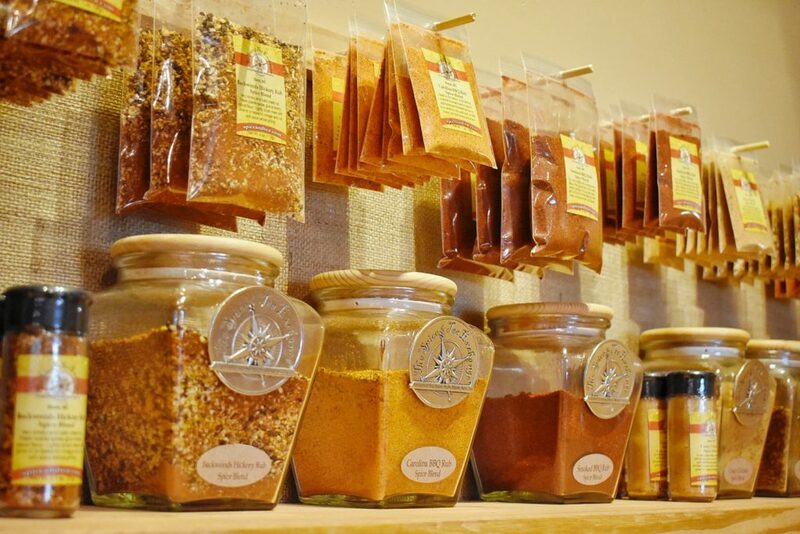 Brand new for 2017, The Spice & Tea Exchange is located in the Scarborough Lane shops in Duck, NC and features quite possibly the largest assortment of fine herbs, spices, teas, and accessories within a hundred miles of the Outer Banks! When we first learned about their opening, we were very eager to get in and experience what they had to offer. Needless to say we were beyond impressed and had to share this new treat with all of our subscribers! All 2017 Summer Boxes featured a 1oz bag of The Spice & Tea Exchange’s Carolina BBQ Rub… a timeless classic and perfect addition to any kitchen in the summertime. Based on the tradition of the delicious mustards & vinegars used in Carolina style barbecues, this sweet and savory rub is perfect for ribs, pulled pork, chicken, brisket, or mixing into dips! The local flavor and essence of southern hospitality does not end there. The owners of The Spice & Tea Exchange have also extended a special offer to our subscribers and readers. Get the “Outer Banks Box” 10% OFF discount when you browse online, then order via email at duck@spiceandtea.com! 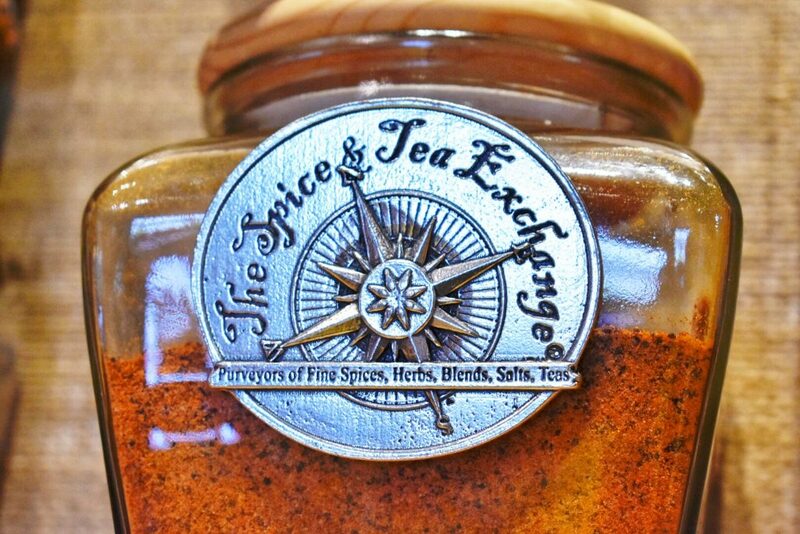 Read more about our experience at The Spice & Tea Exchange here! 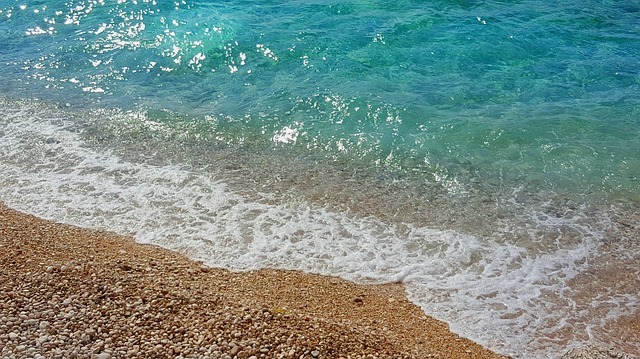 Who doesn’t want a little more beach in their life? 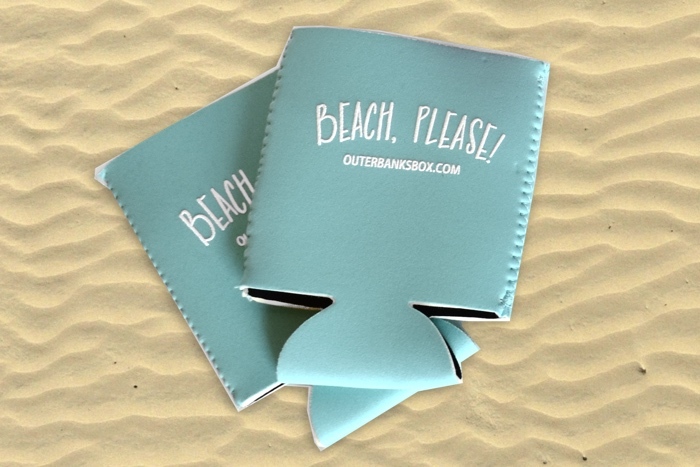 Every subscriber received two of these fun “Beach, Please!” koozies, that are actually made from the same neoprene material as surfing wetsuits. They show off your love for the OBX and are guaranteed to keep you and your drinks cooler this summer! Snag your own pair in our extras store! It wouldn’t feel like summer at the beach without some mouthwatering saltwater taffy! 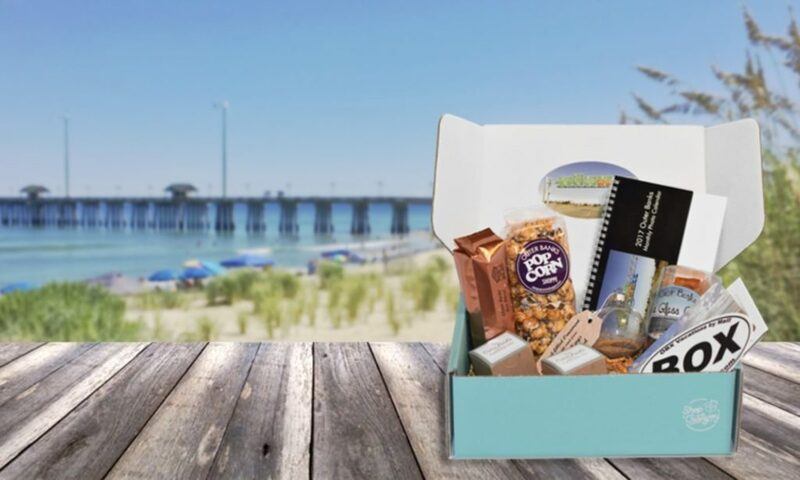 In debating wether to include it in our first summer box or potentially next year’s, we perused the many options from businesses on the beach, including Forbes Taffy & Gifts. When we came across these keepsake bags filled with taffy, there was really no other option! Subscribers received various designs on the bags including: mermaids, sea turtles, seashells, flip flops, dolphins, and starfish. They’re great to keep even after the taffy is gone for collecting shells on your next visit to the Outer Banks! You can buy some of our remaining bags in bulk here at a discount! James Melvin knew at a very young age that he wanted to become a professional artist. James works in oils, acrylics, pastels and colored pencils. Peace is the theme in his work, and the viewer is invited to rest and recall special memories enjoyed while on vacation. He is the illustrator for books such as Suzanne Tate’s Nature Series and is the creator of the Pea Island Lifesavers Series at the N.C. Aquarium in Manteo. James resides in Nags Head, NC and you can find more of his work and even purchase it on his website. He is available for commissioned pieces and his works are enjoyed by collectors from around the world. What we particularly love about his James is that he not only masterfully shares the beauty and history of the Outer Banks in his work, but he actively gives back time to the community as well. 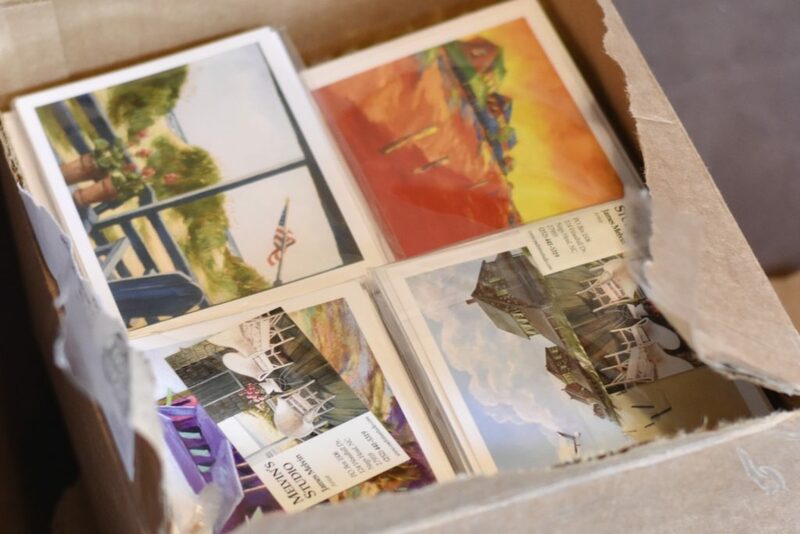 Subscribers received a hand-picked assortment of eight beach scene printed notecards with envelopes. While we were very excited to include local art for the first time in our boxes, we were much more honored and fortunate to share the story and spread the word about the person. There was probably no better fitting gift to go with our summer theme than sunscreen, and premium sunscreen at that! 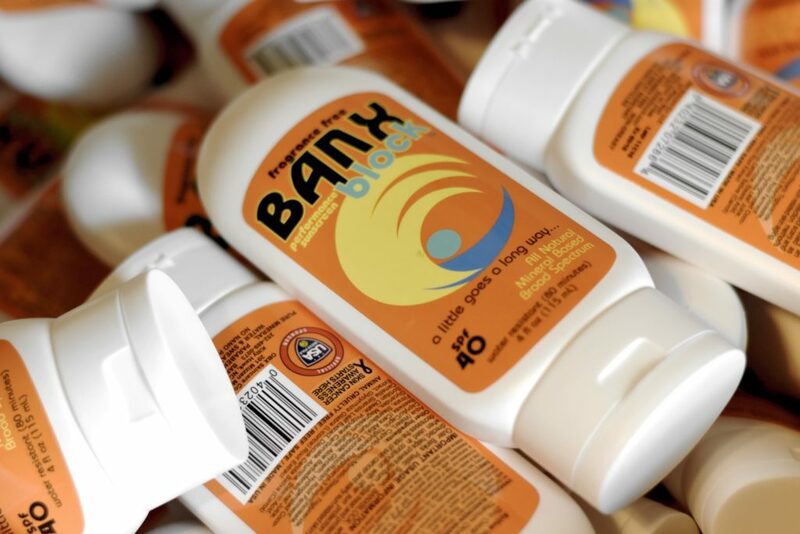 BANXblock is an all-natural, doctor created, surfer approved, and environmentally safe solution to protect your skin from the sun’s damaging rays. 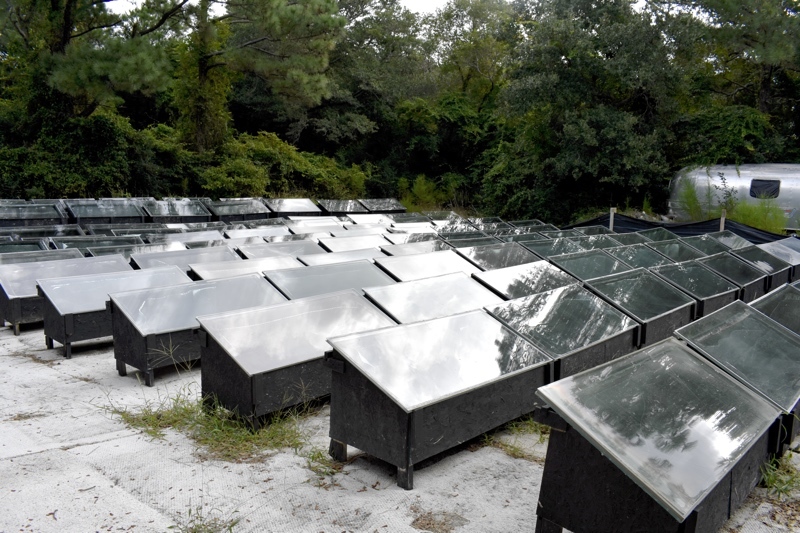 Dr. Jeff Pokorny of Kitty Hawk, NC has been treating the surfers, fishermen, golfers, and sun bathers who live, work and play along the beaches of North Carolina for years and witnesses firsthand the consequences of prolonged exposure to the sun. After treatment or surgery, many of his patients would ask for recommendation on the type of sunscreen they should use while maintaining their lifestyle. After researching all the medical grade sunscreens, Dr. Pokorny found that he could not comfortably recommend any sunscreens currently available on the market to them as it seemed every product either used chemicals that were harmful to the skin or provided inadequate protection from the sun. In the summer of 2013, Dr. Pokorny came up with his own formula and BANXblock was born. Initially, BANXblock was sold only in his own medical offices and in a few local pharmacies. It fell to his wife, Anne and a few of her good friends, to relaunch the product in an attractive and convenient squeeze bottle that an active, happy person would use. 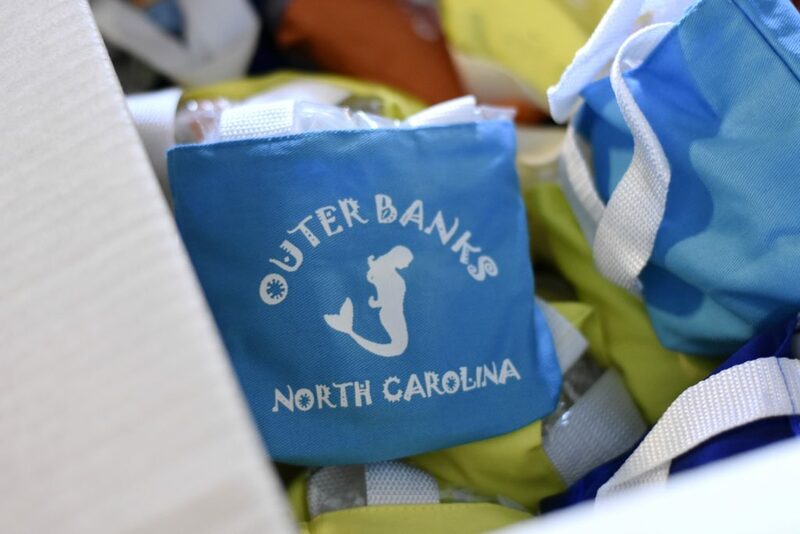 They have done wonders introducing their product into the surf shops and retail stores across the country so we were exceptionally excited to help share their story with Outer Banks Box subscribers! Subscribers received a full size bottle of BANXblock original unscented sunscreen as well as a lip protection balm. Anne and the BANXblock crew are extending a special offer for any of our subscribers and readers who’d like to purchase more BANXblock products. Until 7/31/17, you can use coupon code “Banx in the box” for a massive 25% OFF your total purchase @ BANXblock.com! Make sure to share this offer with your friends and spread the word about this amazing product! 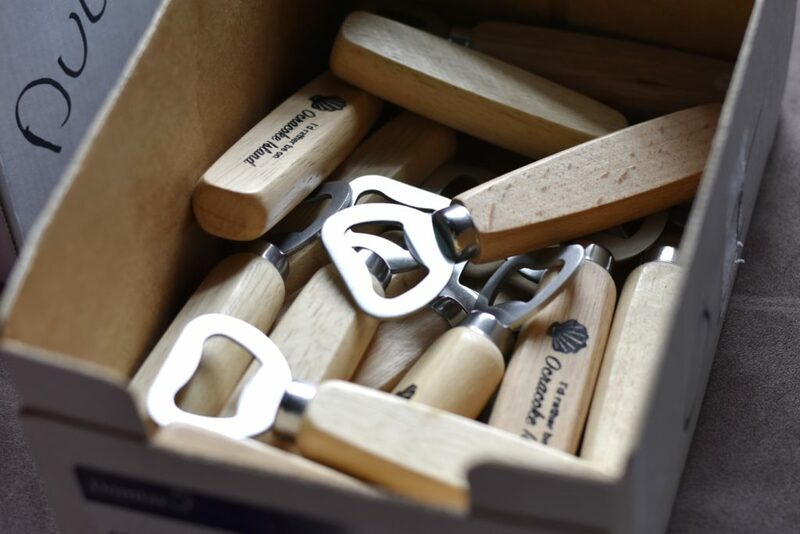 Last but not least, our summer box included a handy wooden bottle opener for cracking open a cold one and daydreaming of the beach! Each opener was hand stamped with a custom beachy slogan and design based on our subscribers’ favorite beach on the Outer Banks. Did you know we’re giving away SURPRISES in random boxes!?! That’s right! As a “thank you” to our subscribers, we’ve started seeking out extra special gifts from the OBX to sneak into boxes at random. For the summer 2017 box, our lucky winner was Gloria in Roanoke, VA! 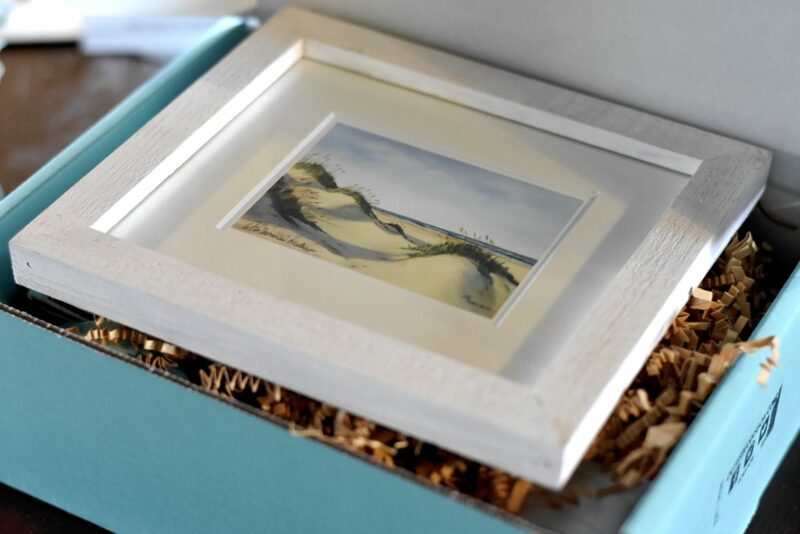 She was shipped the contents as seen above as well as this beautiful framed and matted giclée print of a sand dune scene by artist James Melvin! We have more prizes for the fall box but the only way you could win is by being a subscriber! Have you heard the word? 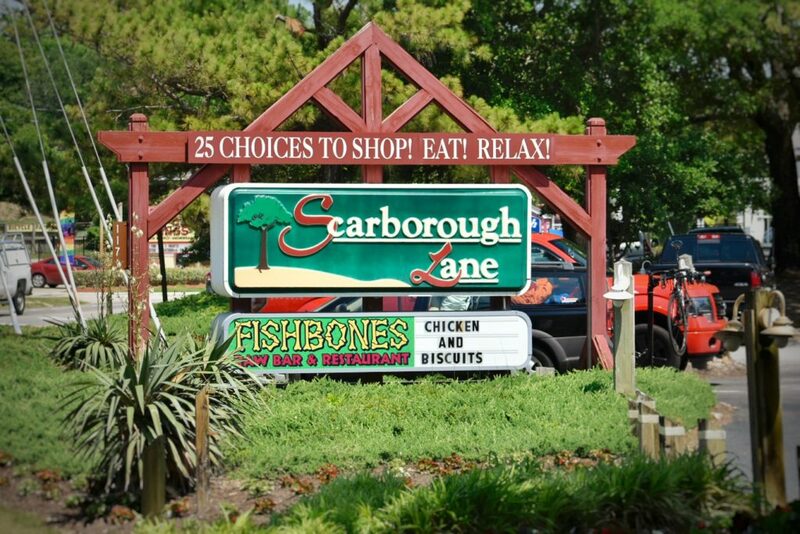 There’s an exciting new shop on the Outer Banks that you absolutely need to explore! Nestled in the Scarborough Lane shops right in the heart of Duck is a brand new location of The Spice & Tea Exchange, owned by Terry Bell and her daughter Megan Scott. 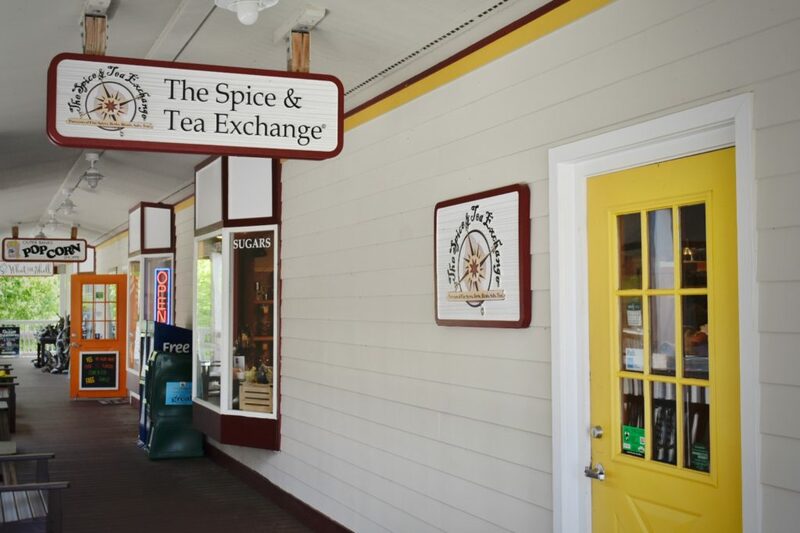 The Spice & Tea Exchange operates under one mission, “Creating & sharing the experience of a more flavorful life,” and in doing so, they’ve brought a one-of-a-kind shopping experience and 18th Century Trading Post retail concept to life right here on the Outer Banks. And let me tell you, it is beautiful! Like many of us, Terry did not always live on the Outer Banks. She was a special needs teacher in Northern Virginia for over twenty five years before moving to the Outer Banks to help get her husband’s construction business up and running. She then opened and operated Outer Banks Restaurant Tours for five years while Megan was an operations manager for a local property management company. I’ve had the pleasure of knowing Terry for a while now, we first met about five years ago while I was documenting one of her restaurant tours in the town of Duck. Before our tour was done, it became very clear to me she had a passion for food as well as a desire to share it with others. It’s easy to see how these shared interests could turn, once again, into something special. After speaking with the franchise representatives and visiting their distribution center, they decided that they would pursue the opportunity of opening their own store. 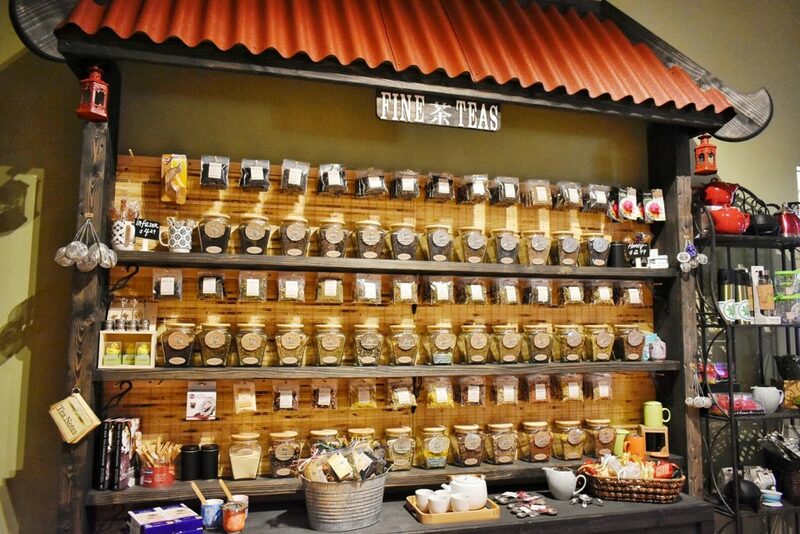 They offer more than 140 spices, over 80 exclusive hand-mixed blends, 16 naturally-flavored sugars, an array of salts from around the world, and more than 30 exotic teas. They also focus on providing high quality products and accessories to home cooks, chefs, and tea lovers in an old-world spice traders’ atmosphere. And it’s really, really cool! When visitors step into the store, they are immediately immersed in a sensory experience where they can explore, open the jars and smell, engage with all of their offerings, and speak with Terry and Megan who truly love what they do. 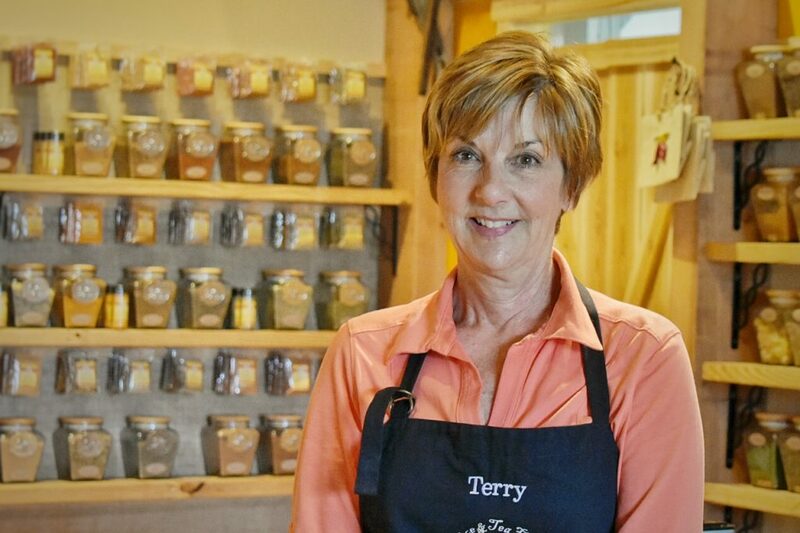 It really is the people and their passion that sets businesses apart these days… and it’s so easy to see the happiness and enthusiasm in Terry and Megan when you visit The Spice & Tea Exchange. You can connect with them on Facebook, read about their product included in our Summer 2017 edition of the Outer Banks Box, and of course, make sure to stop during your next visit to or through Duck to experience this firsthand! Tell them the Outer Banks Box crew sent you! The owners of The Spice & Tea Exchange have also extended a special offer to our subscribers and readers. 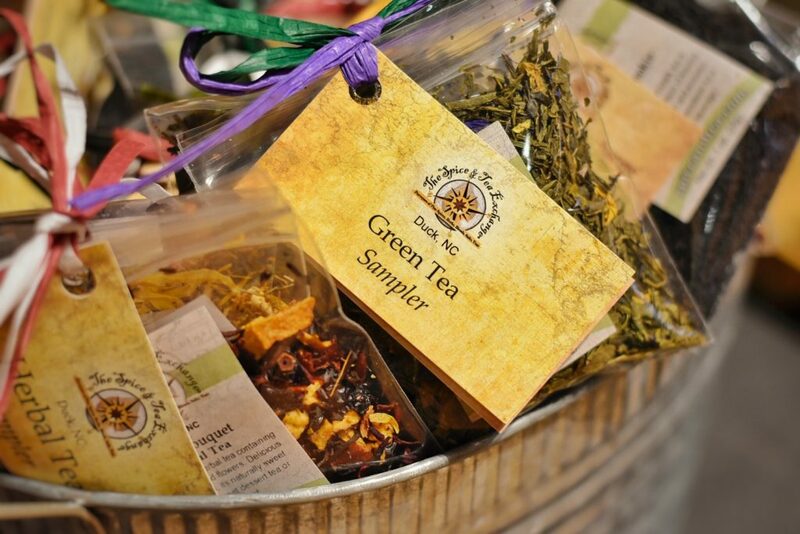 Get the “Outer Banks Box” 10% OFF discount when you browse online, then order via email at duck@spiceandtea.com! Welcome to our first ever, and possibly THE FIRST EVER 360 video of the Outer Banks! We spent a nice sunny day driving down to Hatteras Island and taking the scenic ferry ride over to Ocracoke Island. Hop aboard the Outer Banks Box Jeep and look all over as we take our time getting to the Ocracoke Lighthouse! Make sure to use your mouse to click and drag around and control the camera! Like what you see? Share with a friend! Need more OBX? 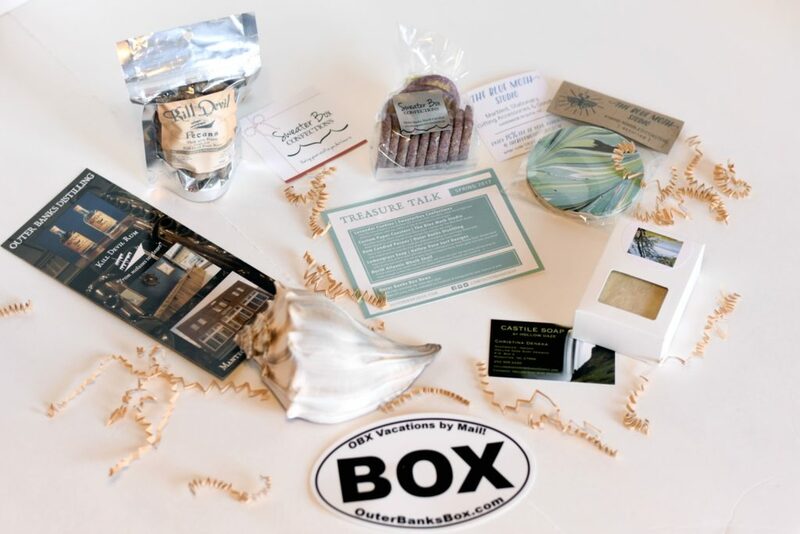 Sign up for our subscription box service at OuterBanksBox.com! Who doesn’t love to get away from it all? Vacations and travel are essential to keeping your work-life balance in check. However, a recent survey reported more than half (56%) of American adults haven’t taken a vacation in the past 12 months. There are probably dozens of reasons for this… such as no time off, or the fact that traveling to vacation destinations isn’t always affordable for every budget. 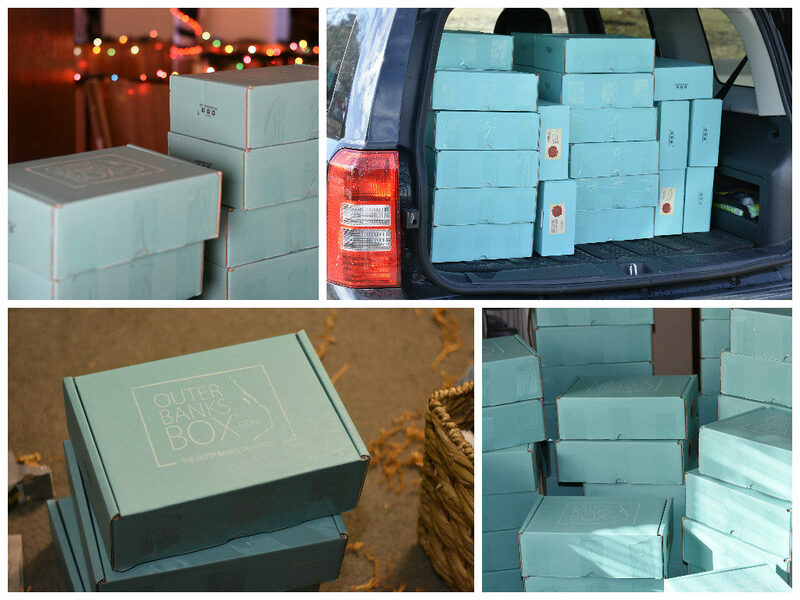 That’s where subscription boxes come to the rescue! According to the Outer Banks Visitor’s Bureau, over 3,000,000 vacationers visited the Outer Banks last year. That’s a ton of people! Think how many of those visitors have not traveled away from home in the past 3 years, or even 10 years. 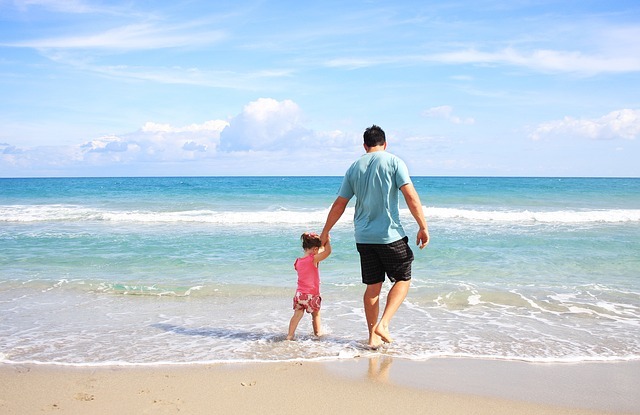 The Outer Banks and other family vacation destinations offer all of us the opportunity to unwind and experience a period of stress-free happiness. Nothing is on your mind but what fun things to do with your time! Imagine if you could experience this feeling more often… say a few times a year. Well, reverting back to the cost of vacationing, this may be pretty impractical for most people. 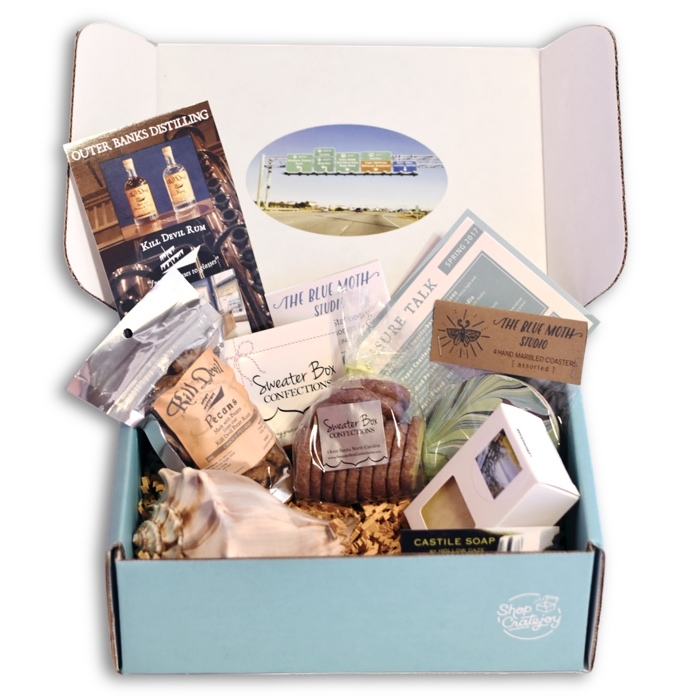 A subscription box service that’s travel or vacation related is the perfect cost-friendly remedy for somebody looking to relive memories of their time away from home and savor the excitement of experiencing new things! There are many vacation destinations in the world, but nearly no other place has the emotionally connected following like that of the Outer Banks. Most visitors have been coming for decades, and plan to keep it as a family tradition for years to come. While away from the Outer Banks, it’s hard to keep your mind off the place! Working long shifts hundreds of miles away all year long sure does create a sense of longing to get away from it all, put your feet in the sand, and relax to the sounds of the seagulls and ocean waves. While we haven’t quite captured that entire package, we feel we’re pretty darn close! 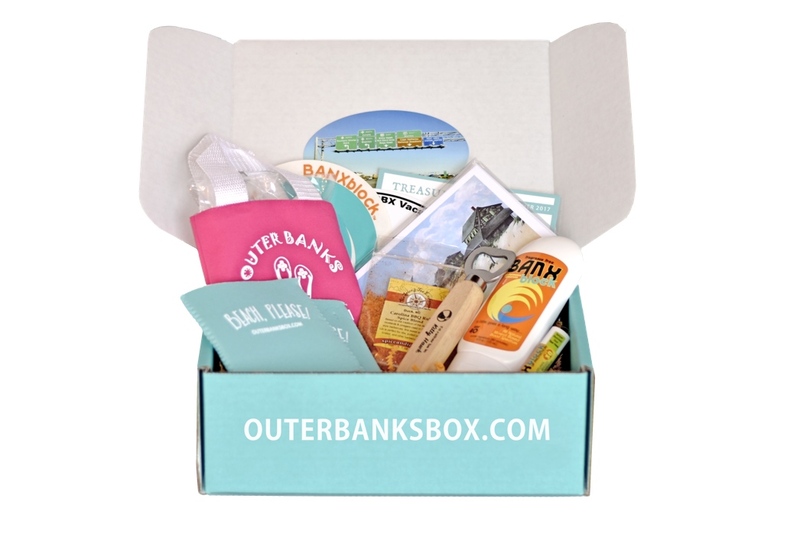 You should check out the Outer Banks Box! If you love the OBX or know someone who does, it really is the next best thing to an actual visit here. We work 365 days a year to find the coolest assortment of items for each of our boxes, and mail four times a year… one for each season! You’ll get a little bit of treats, novelty items, momentos, and an extra dose of that beachy salt air. Visit www.OuterBanksBox.com today to get your own subscription! 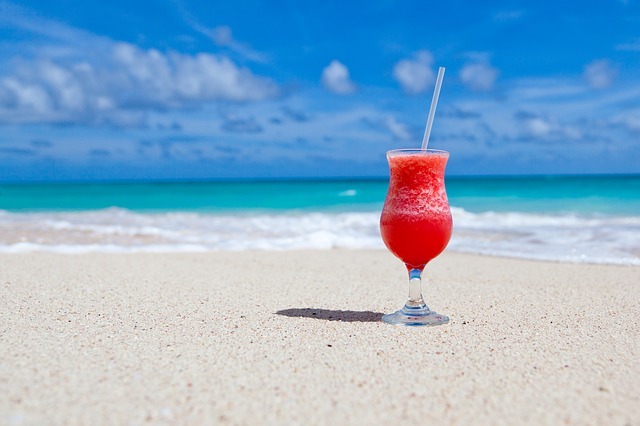 Thanks again for reading, please share with a friend who needs a vacation! Over the past few weeks we’ve gone through another whirlwind of hurdles that new businesses encounter, so we’re beyond excited to finally get to share the contents of our second box! For this shipment, we nearly doubled our subscriber count… so thank you again to all who are continuing to spread the word about our service and help us network to reach more OBX fans and local businesses! With spring inspiring feelings of freshness and renewal, it was our mission to craft a box that delivered these, and more, to your door! Take a look and see what was inside, and make sure to take advantage of our vendors’ special offers! 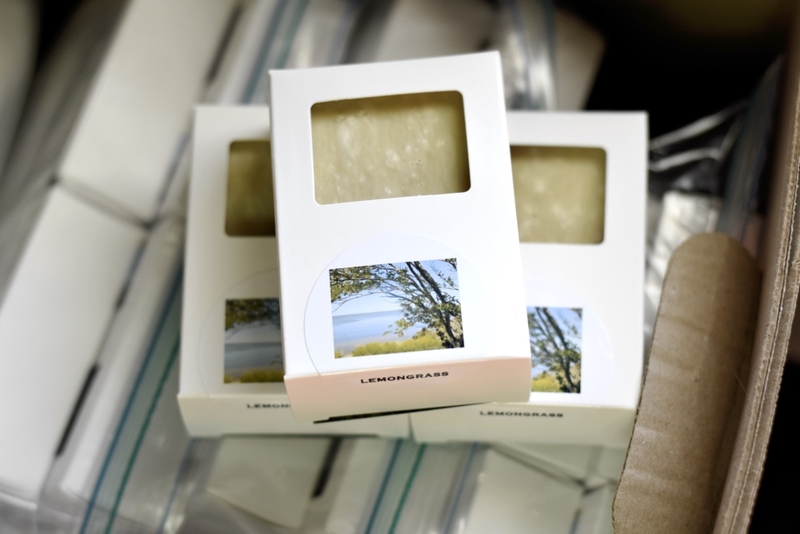 “We hope you enjoyed your Lemon Lavender cookies in your Outer Banks Box! Thanks to those who liked our Facebook page or started following us on Instagram. 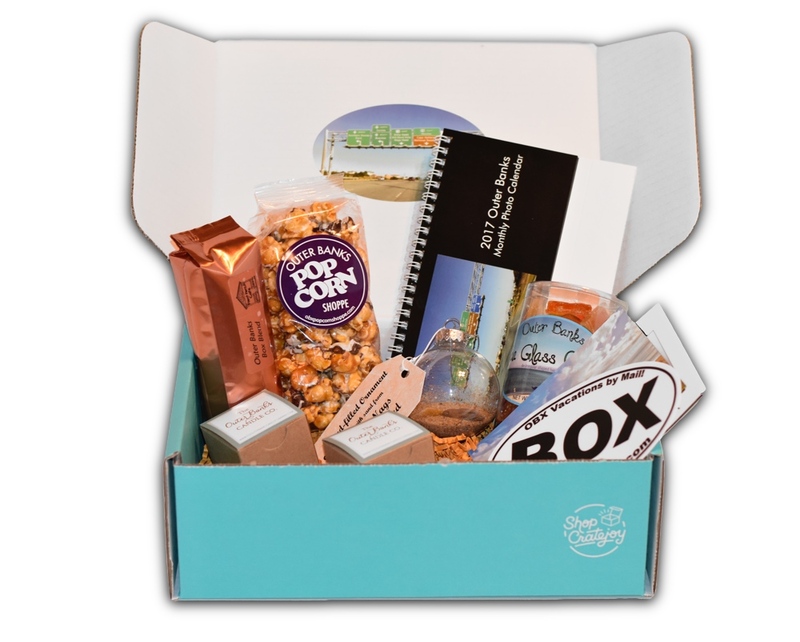 We think Bob is tops and the Outer Banks Box is a fun way to enjoy a little beach when you can’t be here. At Sweater Box Confections we enjoy slowing down and having conversations. We want to invite you to our table by offering you a sweet deal (pun intended) on some treats. Until 4/9/17, we are offering you 20% off your first purchase placed online. It’s a great way to get more lavender cookies and try another item that tempts your tastebuds. Use coupon code: THEBOXROCKS. We were referred to The Blue Moth Studio by some good friends, and are so happy to have discovered them! The creator behind The Blue Moth studio is April Forbes, who has a background in graphic design and a love for hand-made craft. April offers customized orders on many products to make any occasion even more special. Items can also be customized with hand-lettering or by color! 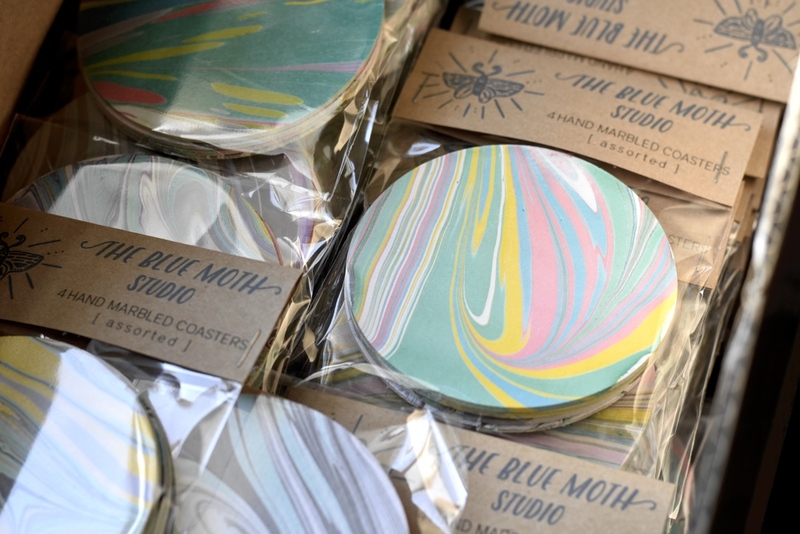 When we first glanced at The Blue Moth Studio’s product display, we were instantly drawn to the marbled colors and whimsical lines in her designs. It really echoed the beauty of the Atlantic Ocean and the Outer Banks so we knew we had to include something in our box! Subscribers received a set of four coasters, each and every coaster created is completely unique! Like what you see? Order your own sets right here and use coupon code: OBXBOX17 for 15% OFF at checkout now through 3/20/18! We first encountered Hollow Daze Surf Designs at an arts and craft show in Southern Shores, NC in the fall of 2016. We were blown away by the quality, selection, and overall presentation of their products. Owner, Christina, was extremely knowledgable and clearly passionate about her products and her brand. Needless to say, we purchased several gift sets that day for family and friends and knew within minutes that we had to share this discovery with our fans and keep all the positive momentum of this discovery moving! Deeply connected to Outer Banks art and craft events, Christina serves as president of the Hatteras Island Arts & Craft Guild and organizes the summer art series Brew & Arts. You can find Hollow Daze Surf Designs at local art shows, the Manteo and Avon farmers’ markets, and on Facebook. If you haven’t heard about Outer Banks Distilling by now, we would be shocked! The crew of entrepreneurial pirates who set up shop distilling rum in Manteo, NC are operating one of the most exciting newer businesses on the Outer Banks. Since the day they opened their doors, we have been patronizing them and sharing their varieties of rum with family and friends. In late 2016, they released candied pecans as a delicious by-product from the flavoring of their Honey Pecan Rum. Needless to say, the market demand was leagues more than the supply, so shortages and sell outs were very common. Fortunately for our subscribers, we love their products and we were determined to share them with you! The team at Outer Banks Distilling was extremely accommodating and sourced custom sized bags just for us! 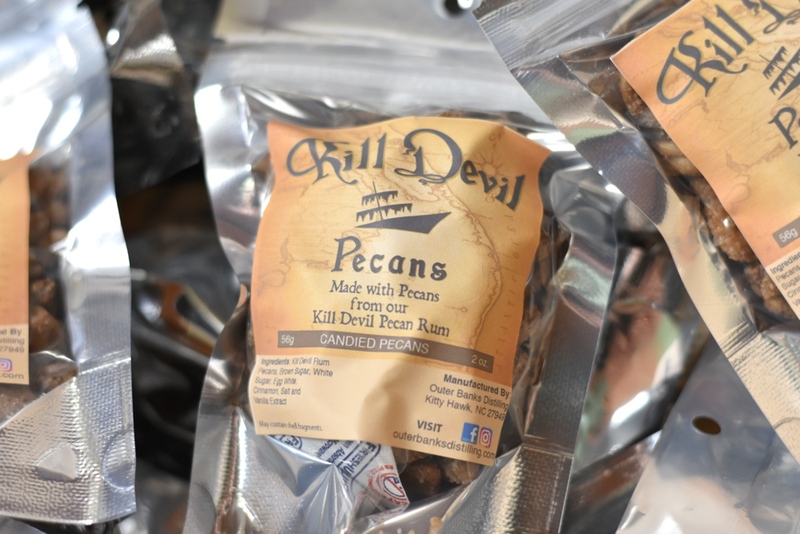 You can still purchase larger bags of the pecans (when available) and all the Kill Devil Rum swag you desire on their website. Thirsty for some of the good stuff? Thanks to a supplier in Washington, DC, you can purchase bottles of their Silver Rum and Honey Pecan Rum right here online! Do us a favor the next time you’re in town, make a stop to their distillery located at 510 Budleigh St. in Manteo and tell them the Outer Banks Box crew sent you! 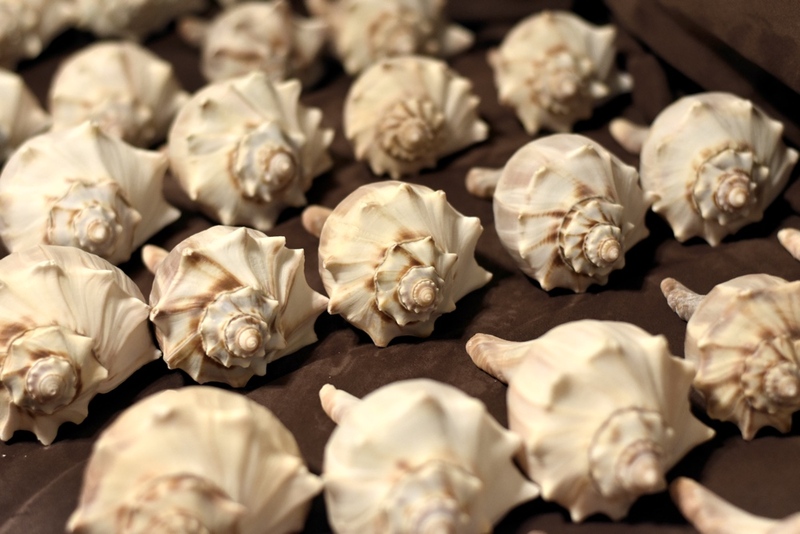 Last but not least, our spring box included a North Atlantic Knobbed Whelk Shell. Knobbed whelks are actually homes to very large sea snails while in the ocean, and are commonly found along the Outer Banks and other east coast beaches. You may have even spotted their egg cases on the beach (they look and sound like a rattle snake tails). This special addition seemed to be thoroughly cherished by our subscribers who left feedback, so we look forward to including more beach treasures in boxes to come! P.S. as of the day of publishing this post, there are a few partial spring boxes left for purchase in our extras store! 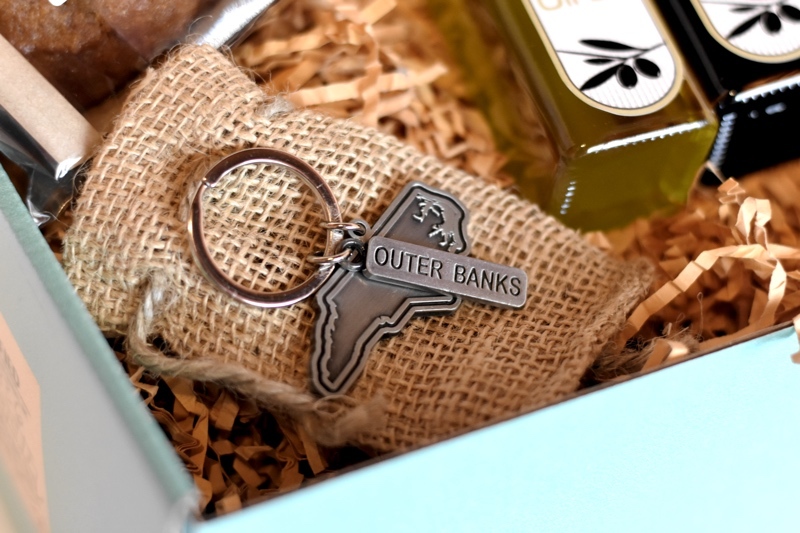 Want to Get Your Own Outer Banks Box? Use code: REVEALBLOG2 to save 10% OFF a brand new quarterly subscription! 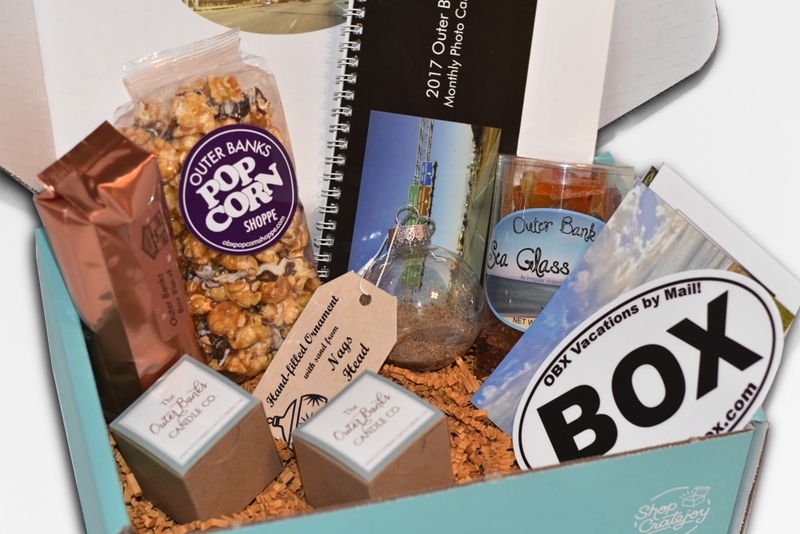 You’ll get 10% OFF your first box and enjoy a new box full of OBX surprises every season! What are you waiting for? ORDER NOW! 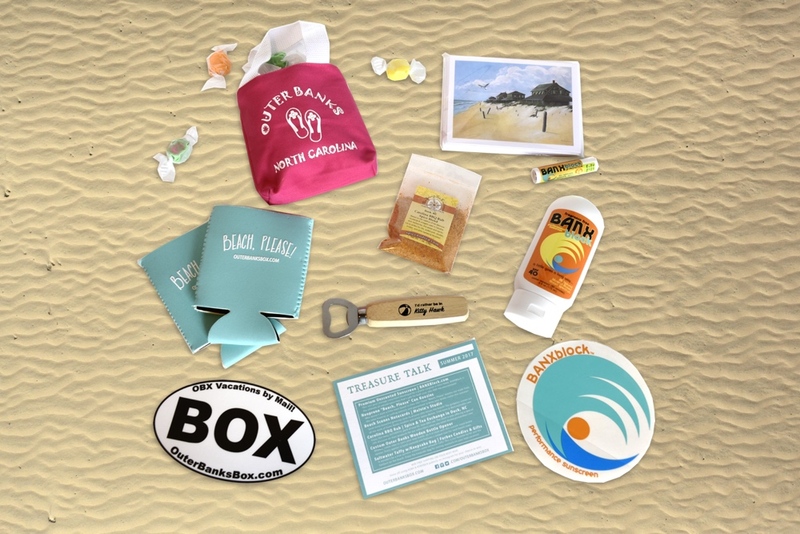 Welcome to our very fist Outer Banks Box contents reveal! It’s been quite an overwhelming few months to say the least, but we’re all excited at the reception to our idea and support from customers. This was the first ever Outer Banks Box, and the assembly process came with quite a learning curve. 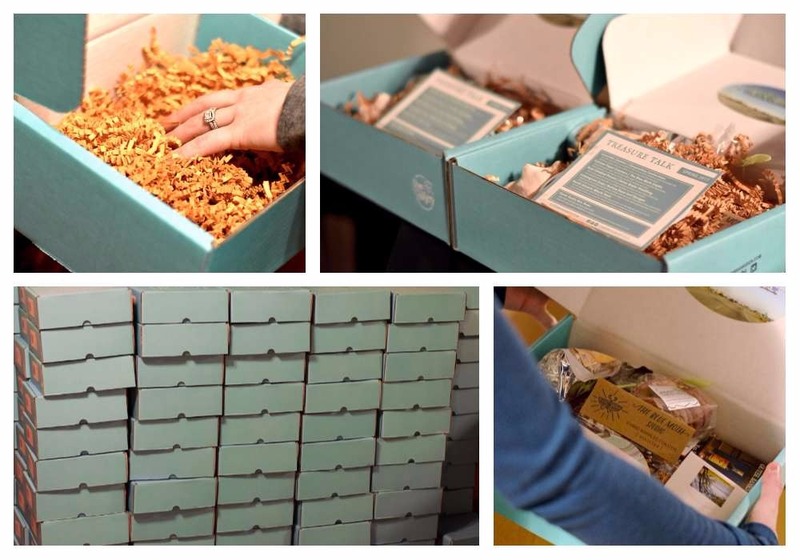 Churning out over 100 gift boxes in our small home proved quite the challenge but we were able to knock it out with the help of some good friends! They say the sense strongest associated with memory is smell. 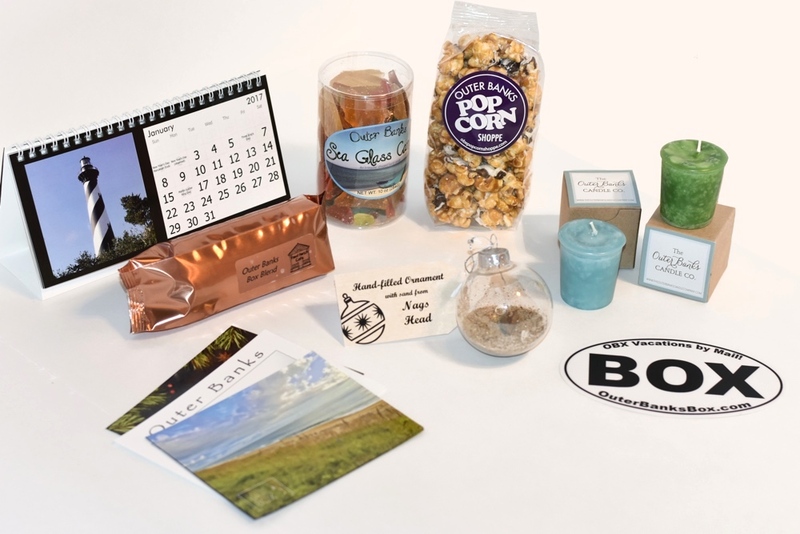 Given that, we had to include a way to captivate your sense of smell and trigger some of your best memories on the Outer Banks! “Beach Pine” and “Coconut Cove” were our choices, so a festive holiday scent could grace your home and then a beachy, all-seaon candle would follow. Owner Kimber Smith hand pours all of these candles in her workshop in Kitty Hawk, using only the finest materials available. 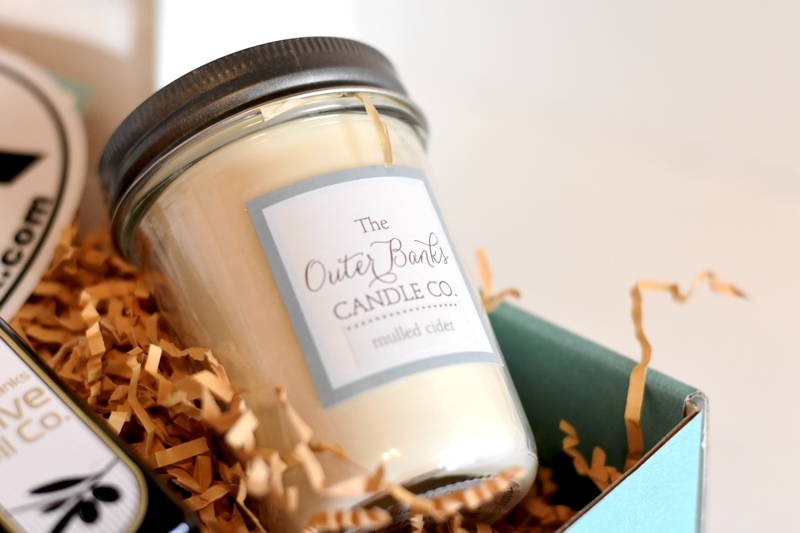 Explore her passion for candle making and order more wonderful scents by visiting TheOuterBanksCandleCompany.com. You can use code “OBXCANDLES” for $10 off any $50+ purchase. Is there anything better than sipping a freshly brewed, hot cup of coffee while you take in the breathtaking Outer Banks scenery? We think not! That’s why we were adamant about including locally roasted coffee in our inaugural Outer Banks Box. Their expert roasters were able to craft a blend of beans that fit our perspective of the Outer Banks: enjoyable by all, inescapably addicting, and with a touch of edge and mystery. Our final creation proved to be exceptionally smooth and inviting, but with a touch of smokiness and complexity. You can order additional bags of Outer Banks Box Blend soon in our store, and visit FrontPorchCafe.com for a wide variety of coffee and gifts! A treat you could only get with Outer Banks Box! We rounded up twelve of our favorite photos from the past year and put them into a custom desk calendar for your home or workplace. Each month shows a different perspective of the OBX, and takes you away to that special place at every glance! A popular snack producer on the OBX, the Outer Banks Popcorn Shoppe uses only the largest kernels of corn available with the most surface area as possible for adding delectable coatings and flavors. As our first shipments were headed out during the holiday season, we decided an indulgent flavor was only fitting. The Drizzle features premium white and milk chocolate over caramel corn. It tastes even better than it sounds! Head over to GourmetPopcornAndGifts.com to learn more and order your own batch! Another custom gift, we drove all over the Outer Banks collecting sand and shells for this one-of-a-kind keepsake ornament. After it was all said and done, your ornament included sand/shells from the beach town set in your preferences! A staple of the Outer Banks for decades, Forbes produces some of the tastiest candies available, and brings back vacation memories every time you see the name! When perusing the stores this summer, we came across the sea glass candy and knew we had to include it in our boxes! The fun breaks of “glass” are available in multiple fruity flavors, including the beautiful mixed variety that was included in our winter box. Last but not least, we included a beautiful keepsake magnet with a stunning photograph of the Outer Banks in every box. Best placed in high traffic areas, it will bring a little peep of happy to your day! Also included was our twist on the iconic OBX sticker, our “BOX” oval stickers are a fun way to show off your love for the Outer Banks and share the story of your subscription! Does this sound like fun or what? We think you need to get your very own Outer Banks Box, and would like to share this special offer with you. 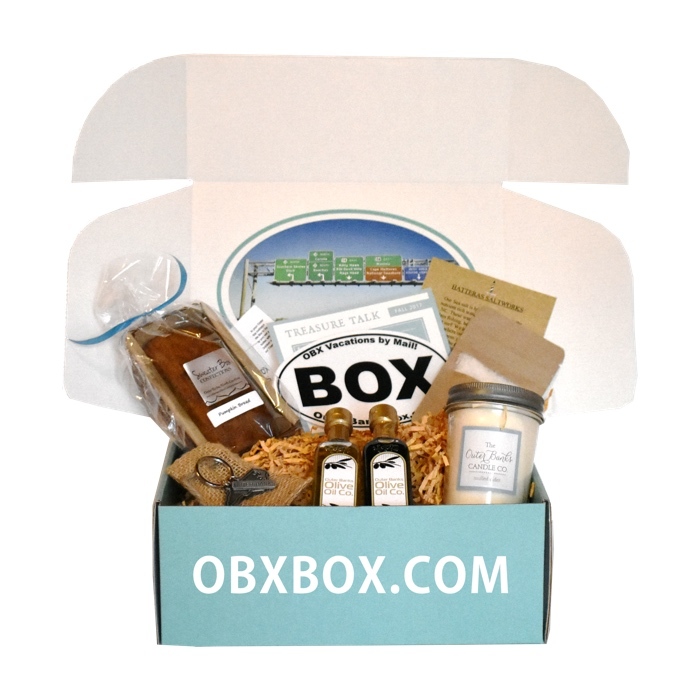 Use code “REVEALBLOG1” to save 10% OFF your very first Outer Banks Box on the quarterly billing plan! What are you waiting for? Order yours today!